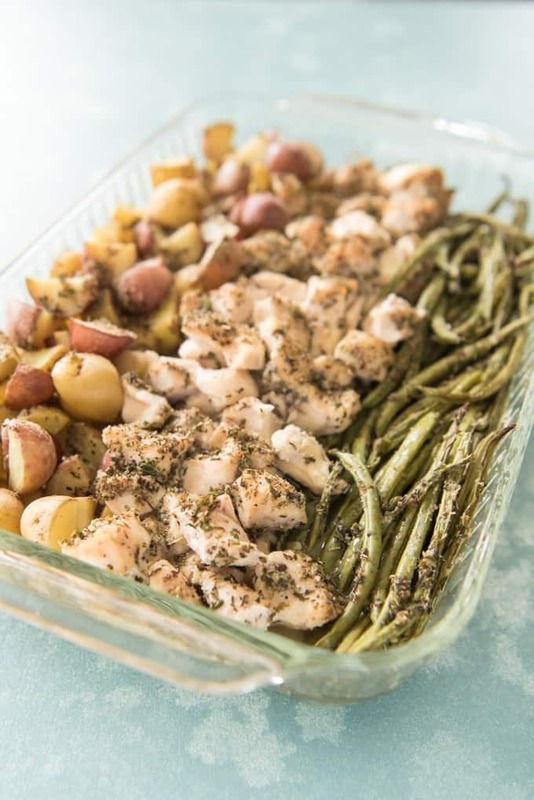 This easy one pan green bean, chicken & potato dinner takes no time to throw together and you don’t have to dirty dozens of dishes to do it! 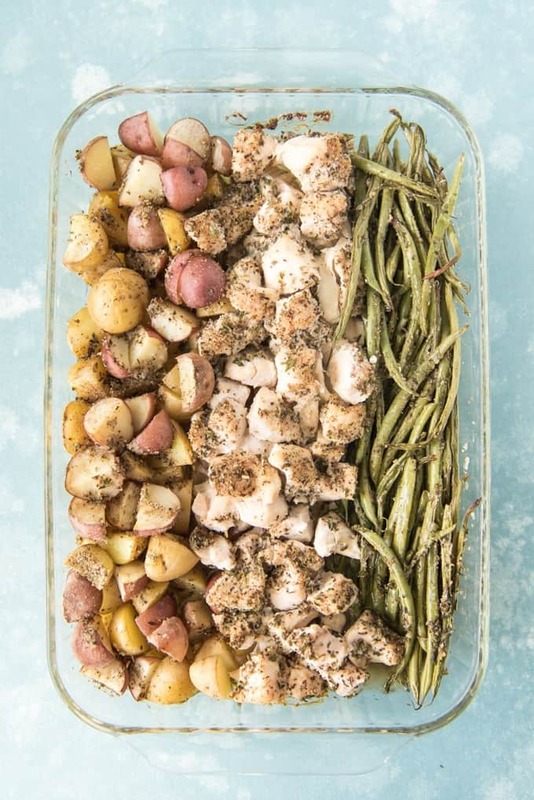 The savory herbs on buttery bites of roasted potatoes, chicken & green beans are sure to satisfy a hungry family and make this easy weeknight dinner a winner that you will want to make over and over! About a year ago, I underwent jaw surgery to fix a crossbite and overbite (adult orthodontia – yay! said no one ever). It was a pretty miserable experience having my jaw broken in five places and wired shut for a few weeks. But I lucked out in that some friends banned together and set up a dinner schedule to feed my family while I was recovering. 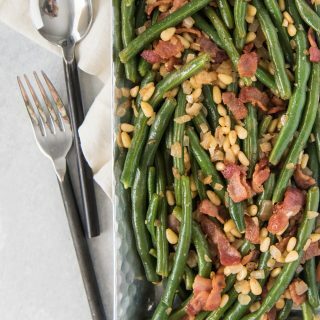 One of the dinners looked and smelled so delicious and my family raved about it so much, that I had to figure it out so I could make it once I could eat solid food again! It was this awesome little one-pan-wonder (literally, the blog where I found my recipe inspiration, High Heels & Grills, calls it that!) 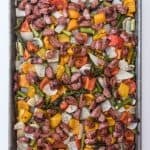 that is sort of casserole-ish in that your protein, veggie, and carb/starch are all cooked together in a baking dish in the oven. Another thing I love about this meal is that you can make it Whole 30 compliant just by subbing in ghee for the butter. 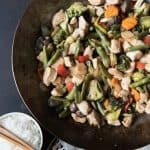 It’s not quite the same, but the difference is so small that it really is not a big deal, and I think one of the easiest ways to do Whole 30 is to avoid the wackier, more inventive recipe creations and just stick with pretty familiar, satisfying fare while you are adjusting. 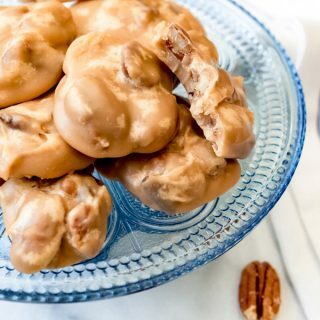 Just in case anyone out there is thinking about trying a Whole 30 for the first time. 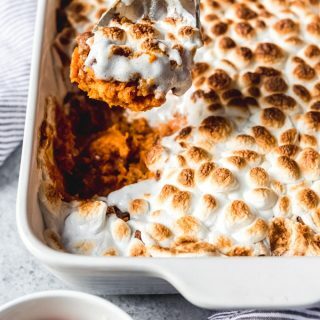 If you are, you might want to check out some of the other Whole 30 compliant recipes posted on House of Nash Eats! Every single one is something that we make on a regular basis, regardless of whether we are doing Whole 30 or not. I keep adding to the collection, especially this month as we are now 20 days into our third round of Whole 30. 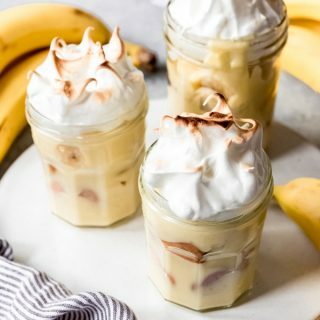 Some are staples like homemade aioli or sauces, and others are actual meal options, but each one is definitely a keeper. The recipe is so simple, really. 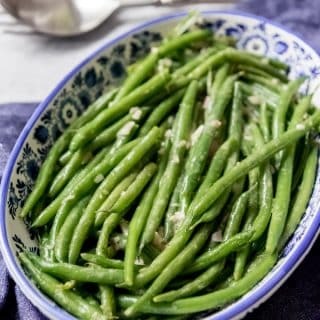 It’s just a matter of chopping up potatoes and chicken breasts into bite-size pieces and arranging them, with green beans, in a baking dish. 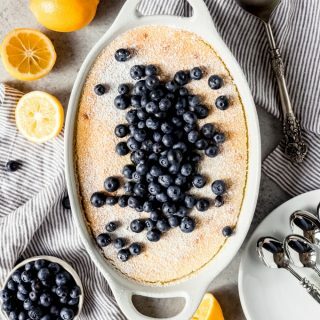 Then you place pats of butter on top (or just use ghee instead if you are looking for a Whole 30 compliant version), and sprinkle it with a quick blend of herbs that are already in your cupboard (or a packet of Italian dressing mix if you are in a rush and not worrying about Whole30 compliance) and it’s ready to go in the oven! It seriously takes me about 10 minutes prep time at any time during the day, then I can cover it and keep it in the fridge until later. It’s perfect for nights when I know we will be running late from gymnastics or other lessons because all the work can be done ahead of time. 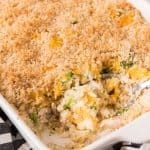 The girls actually eat this casserole better than most because it isn’t covered in a creamy sauce, which they sometimes rebel against (it’s something we are working on). 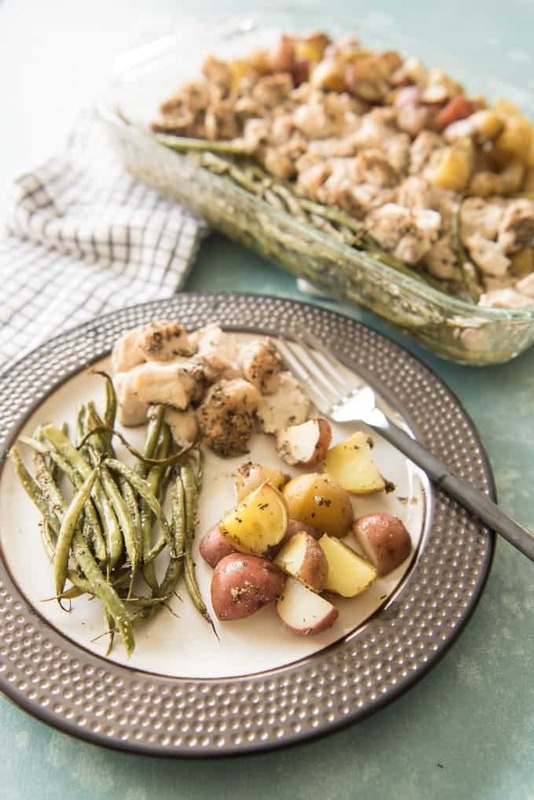 But the herb roasted potatoes and tender, buttery bites of chicken and green beans are always a hit with the girls. The leftovers aren’t bad the next day, either! 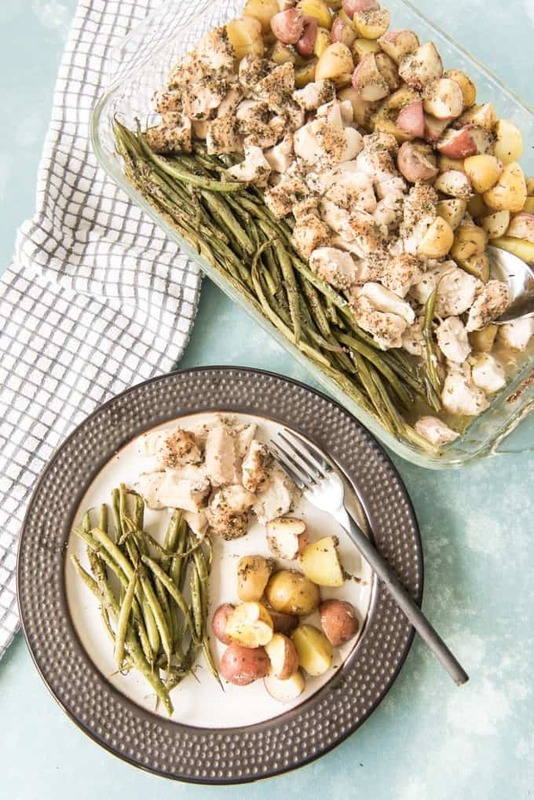 This easy one pan green bean, chicken & potato dinner takes no time to throw together and you don't have to dirty dozens of dishes to do it! 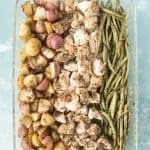 The savory herbs on buttery bites of roasted potatoes, chicken & green beans are sure to satisfy a hungry family and make this easy weeknight dinner a winner that you will want to make over and over! Preheat oven to 350 degrees. In a small bowl, mix together all of the herbs & spices. Set aside. 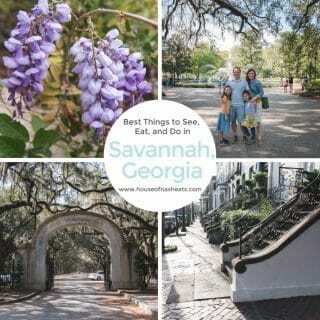 Prepare the green beans, chicken and potatoes as directed. 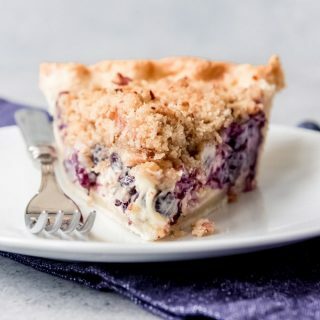 Arrange in rows in a 9x13-inch baking dish. 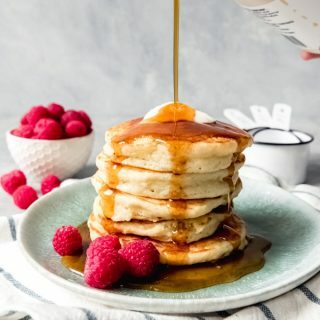 Slice the butter into thin pats and arrange them evenly around the top of the other ingredients. 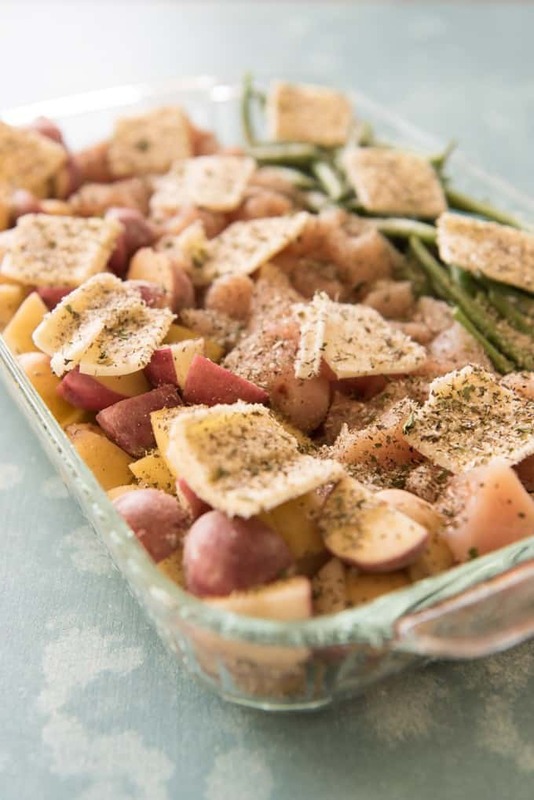 Sprinkle the herb blend evenly over everything, then bake in the oven for 50-60 minutes, or until the chicken is cooked through and the potatoes and green beans are tender. You can replace all of the herbs and seasonings with one packet of dry Italian dressing mix or Good Seasons Garlic & Herb dressing mix if you would like.